One in twelve men suffer from color vision deficiency (CVD). It’s a guarantee that many of the people reading this suffer from it as well. There is now a company that offers a solution to color blindness. Being a color blind photographer obviously poses some major issues. Having CVD myself, I’ve spent a lot of time researching what it means in order to combat this deficiency and know how it’s affecting my work. 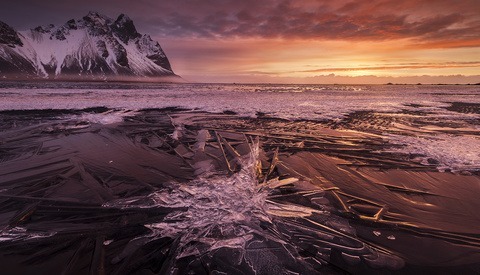 Since this condition is fairly common in men, there are some well-known photographers that suffer from it as well, Joel Grimes being the best example. Like most, I was diagnosed when I was a child. My parents noticed that the names I assigned certain colors were not in fact those colors. Dark and very light colors seem give me the most trouble. Dark red and green often look the same to me. Most of the time, I don't see pink at all; to me, it's light gray. Fortunately, bright and primary colors don't give me any trouble. Luckily for me, my color blindness is fairly mild and doesn’t affect my work for the most part. The time that I have to be most careful is when it comes to printing. 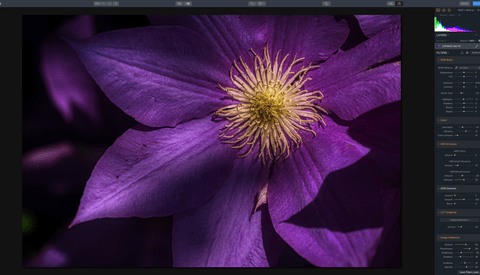 It's often very difficult or even impossible for me to see a color cast on a photo. For instance, when I was in college, my professors pointed out on multiple occasions that my photos had a red or magenta color cast, which I was totally oblivious to. Another instance of when my vision affected me that clearly sticks out in my mind was when I was working on solving a 12-sided Rubik's cube. Two of the colors looked identical to me, leading the cube to be solved improperly. Color vision is similar to pixels on a camera sensor when it comes to sensing color. There are parts dedicated to sensing each individual color. There are two types of photoreceptor cells in the retina of the eye: rods and cones. Cones are what sense color and work best in relatively bright light. There are three types of cones: S-cones, M-cones, and L-cones. 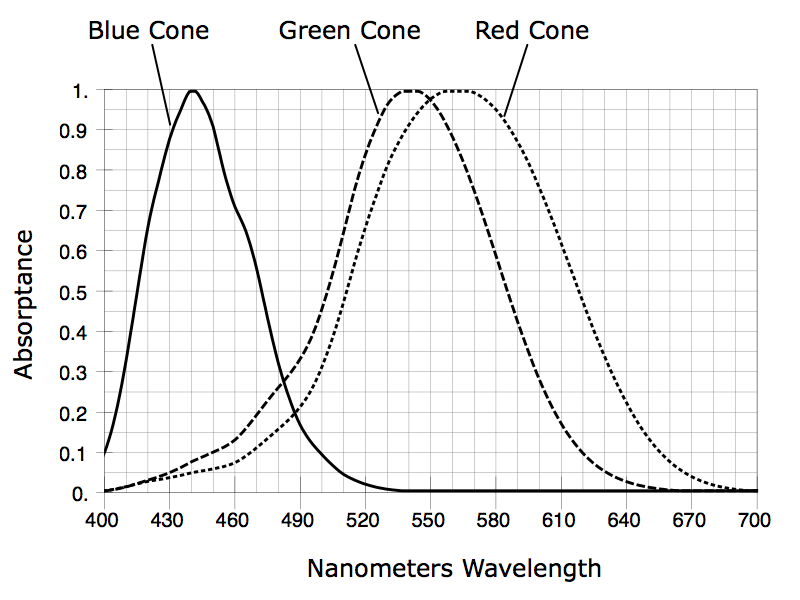 Each type of cone is sensitive to a range of wavelengths of visible light. Rods are sensitive in low light, but are not very sensitive to color. This is why everything appears monochromatic to us in low light. Both rods and cones contain photopigment molecules that undergo a chemical change when they absorb light. This chemical change triggers electrical signals that are passed from the retina to the visual parts of the brain, resulting in vision. 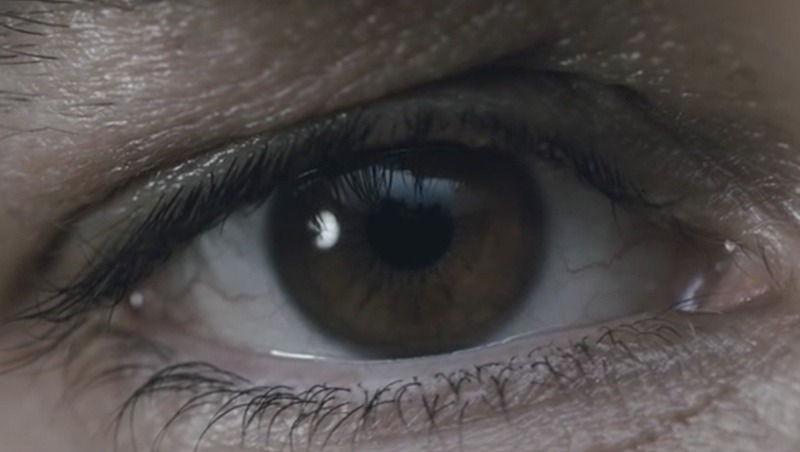 Each person perceives vision differently due to our differences in physiology. Even if I didn’t have CVD, my red would be different than your red. The term "color blind" is used very often, but the term "color vision deficient" is more accurate in most cases. Most people are not truly color blind and can see most, if not all colors to some degree. There are three main kinds of color blindness, each affected differently by the three different types of cones. Red-green color blindness is the most common, followed by blue-yellow color blindness. A complete absence of color vision is rare. CVD affects 1 in 12 men (8%) and is much rarer in women, affecting only 1 in 200 (0.5%), genetics being the cause. Men are much more likely to be colorblind than women because the genes responsible for the most common inherited color blindness are on the X chromosome. Males only have one X chromosome, while females have two X chromosomes. In females, a functional gene on only one of the X chromosomes is enough to compensate for the loss on the other. This kind of inheritance pattern is called "X-linked" and primarily affects males. Inherited color blindness can be present at birth, begin in childhood, or not appear until the adult years. Below are two diagrams, the first depicting normal color vision and the second depicting color deficient vision. 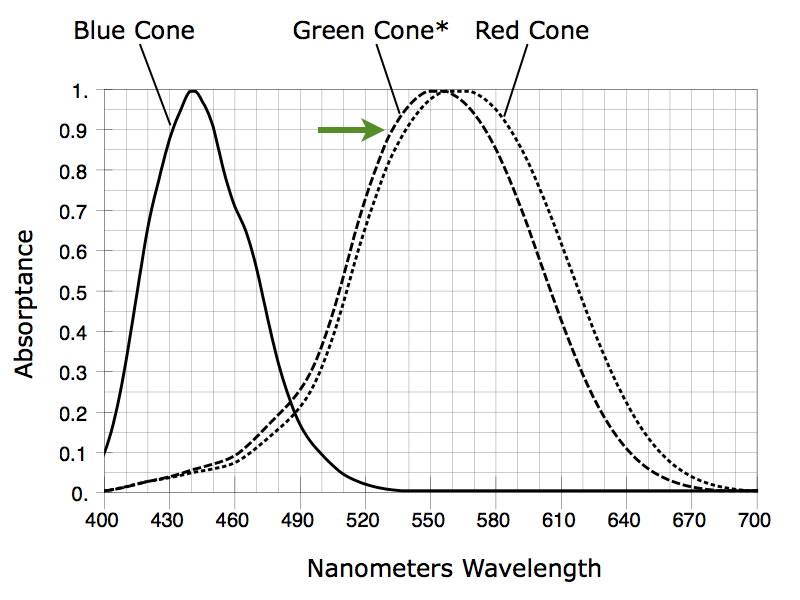 Inherited color blindness is caused by abnormal photopigments. The genes required to create the necessary photopigments may be missing or defective. For instance, some defects alter the photopigments' sensitivity to color, making them slightly more sensitive to red and less sensitive to green. 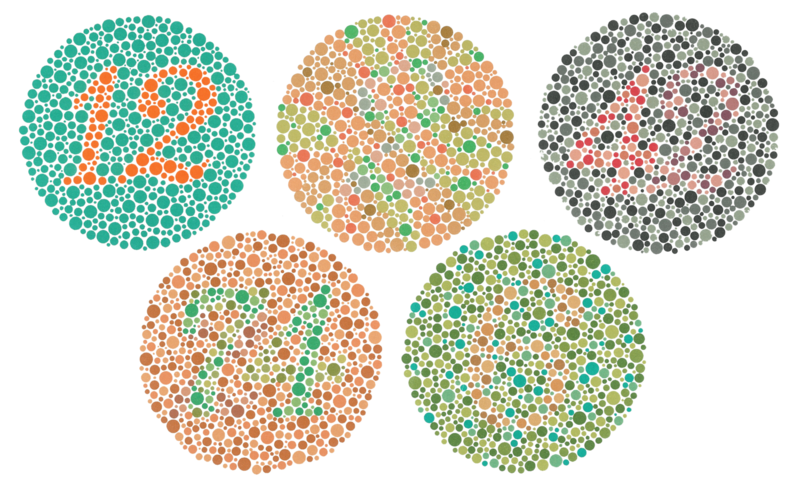 Color blindness is most commonly diagnosed using an Ishihara test. An Ishihara test is a plate with different colored dots, usually concealing a number or path to follow through the dots. They are the bane of my existence, because for me, most of them contain nothing. Below are a few examples of Ishihara tests. I can only see numbers in the first two and possibly something in the third. Enchroma is a company that makes glasses that compensate for color vision deficiency. While this is not a cure for it, having bought a pair myself, it does help. Unfortunately, the act of filtering light makes it imperfect, and it does not offer completely correct color vision. There are no cures for CVD at the moment, but there is research going on for gene therapy that may be an actual cure. Until then, these glasses will have to suffice. Enchroma offers different types of glasses, and they can even cut the glasses to fit your frames and add your prescription to the lenses. I bought their glasses that are meant for computer and indoor use. This type has the smallest effect on color blindness, because the filtering is not very dense. They also have sunglasses that affect vision more due to their density. The only drawback to these glasses is that they are fairly expensive. But, if you're like me, you probably want to have some sense of what normal vision is like. In my opinion, they are well worth the price. Before taking the plunge, take the test Enchroma has on their website. It will tell you if their glasses will actually help your color blindness. Everyone is different, so it may not work for everyone. Are there any other color blind photographers out there? How does it affect your work? I can see the first Ishihara test clearly. I see nothing in the third and fifth tests, but I think I can make out a "2" in the second one and a "74" in the fourth, but I'm not 100% sure if I'm right. Interesting how everyone's CVD is slightly different. I bought one of these pairs for my brother - who's colorblind - last year, and I can confirm that it works. My brother almost broke out in tears when he could finally see how green the grass is, and how green the leaves are on trees (previously, both leaves and trees looked brown-ish to him, I'm told). The things we take for granted. How do we know that the people who discovered-invented colorblind tests are not colorblind themselves?I I figure it's based on what the majority of humans interpret color thru the years. You test it on a population large enough to render the probability of the entire sample being color blind highly unlikely. Thank you for writing about this. As a colorblind photographer I love knowing that there are others out there. When enchroma and valspar released that video I commented and shared my story. They were kind enough to send me a free pair of glasses. I went through these tests as a kid. I can see the numbers in 1, 3, 4, and 5, but not 2. I am also extremely frustrated with having CVD. So much so, that I started to shoot 95% monochrome. Got tired of asking my wife to go through my images to check for casts. Ive tried using colorcheckers and other tools to help me get the best color rendition, but casts can be introduced with playing around in software, and then I wouldn't notice.Keen to try their test, and see if this would benefit me. I have issues with telling apart, green and red, blue and purple, yellow and orange, pink and grey. I hope it works out for you! Tons of videos of people's reactions after putting these glasses on. Hopefully one will be of you.